Financial contributions are the best way to assist The Salvation Army with helping those affected by disasters. Monetary donations allow the Salvation Army to purchase product to meet the most urgent needs. When feasible, purchases are made near the disaster site to help stimulate the local economy and ensure quicker delivery to those in need. All money donated to The Salvation Army designated for a specific disaster goes to support the service work surrounding that particular disaster. Disaster fund-raising effects only disaster-specific work; not the overall social service work that the Army provides to nearly 30 million people each year. If you wish to designate your gift to a specific disaster, you may do so at the time of your donation. 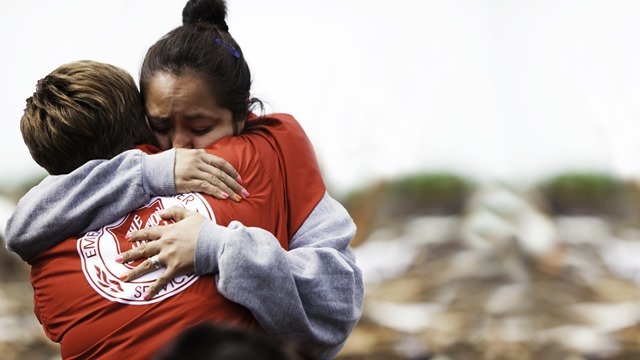 Monetary donations can be made by calling 1-800-SAL-ARMY (725-2769) or online at disaster.salvationarmyusa.org/give. You may also send your contribution to your local Salvation Army.